LORINO, Russia – Maj. A.H. Polosen was not smiling. The stern Russian Border Guard officer – a member of the notorious FSB (Federal Security Bureau), the former KGB – boarded our bus in the remote Bering Sea village of Lavrentiya demanding our "documents." That's when our 16-hour detention, trial and sentencing started. For two weeks starting in late June, I joined eight other adventure travelers for a hands-on look at the Russian Native villages across the international date line from Alaska's Seward Peninsula. We racked up about 330 miles bouncing through the frigid Bering Sea in 18-foot aluminum whale boats, surrounded by spouting gray whales, an occasional walrus and once-thriving villages forced to be abandoned by the Soviet Union. Our group included three award-winning Mexican filmmakers and six Alaskans, including a Little Diomede Native traditional healer hoping to find long-lost relatives. My purpose was documenting the post-Soviet changes in this region since I last visited in 1988 with Gov. Steve Cowper. Then, Alaska and Soviet Far East residents were giddy to melt the post-Cold War Ice Curtain and launched more than two decades of productive civic, educational and commercial exchanges across the Bering Strait. Nearly 30 years ago, most of these Soviet communities were thriving with collective enterprises such as dairies, leather tanneries, fox farms and ample subsidies from Moscow. Today, thousands have left the region for better opportunities in western Russia, leaving behind a tundra littered with rusting military equipment, fuel drums and bleached whale bones. 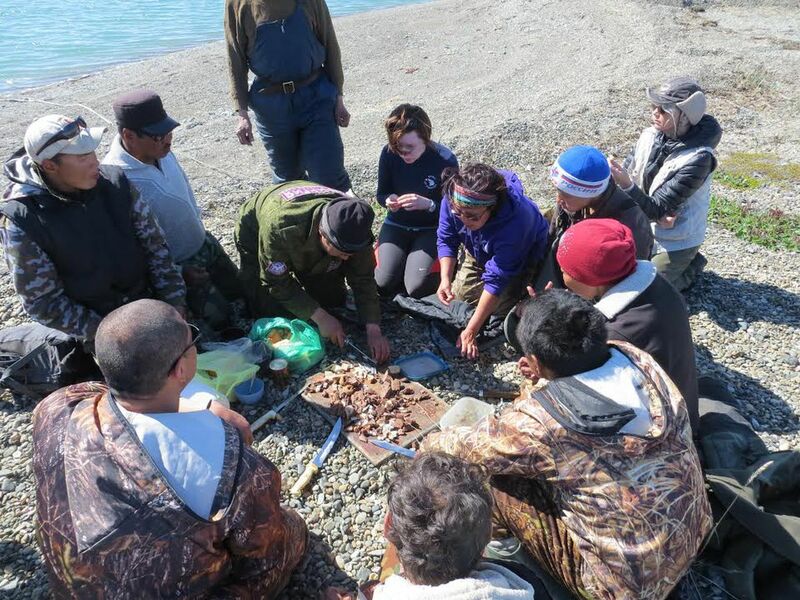 Many communities are making a slow but successful transition by returning to their traditional Native subsistence roots as marine mammal hunters, while their children walk dusty village streets with cellphones surfing the Internet. Our trip began in the regional hub of Provideniya, where in 1988 Alaska Airlines landed the Friendship Flight to reunite Alaska Natives with relatives long separated when the U.S. and USSR closed the Strait in 1948. Half of Provideniya's 5,000 residents have left, leaving boarded-up apartment buildings, stray dogs and dwindling jobs. Many of the gray concrete apartment buildings we remembered are now adorned with bright blue, red and yellow metal siding, but none of the manufacturing we saw then remains. An economic bright spot is an attempt to attract well-heeled tourists to visit spectacular Bering Strait scenery preserved in five federal parks known as Beringia. Last year, just 800 visitors made the trek but the Russians hope to attract more cruise ships. As our whale-hunting captains cut across whitecaps, soaking us in 40-degree Bering Sea spray about 160 miles northeast of Provideniya, we made out land on the distant horizon. Slowly, Russian Big Diomede came into view, and next to it Alaska's Little Diomede, just 2 1/2 miles separating them. We circled our three bobbing boats long enough for Etta Myrna Tall, an Alaska Native who had located a few Russian relatives, to offer a brief prayer of thanks for a sight she thought she'd never see – the western cliffs of forbidden Big Diomede. A few moments later a gray whale spouted and flipped its tail, perhaps a welcome for us Alaskans so close to home. We landed on the gravel beach at Asia's northeasternmost point, once the site of the thriving Native village of Naukan. At the height of the Cold War beginning in the late 1940s, the Soviets ordered many northern Native villages abandoned, including those on Big Diomede, and consolidated indigenous peoples of different languages and cultures into regional hubs. Today Naukan is an eerie ghost town; only three erect whale ribs and the rocky foundations of the homes of 300 banished residents cling to the grassy hillside. From a monument at the site to 16th century Russian explorer Semyon Dezhnev, we could easily see a hill in the Alaska mainland village of Wales just a 54-mile seagull flight away. Less than an hour later, we passed through the Bering Strait into the Chukchi Sea to Uelen, Russia's northeasternmost community. Home to about 700 mostly Chukchi Natives, Uelen boasts a world-renown ivory carving school and tries to preserve its Native culture with Chukchi language classes. But resources permit only two classes weekly, and since increasingly fewer adults speak Chukchi and rarely teach their children the language, local officials predict it will soon disappear. Much the same is happening with Alaska's far-north Native languages. The lack of adequate housing is the largest problem in every village we visited. Posted in Uelen's city hall was a list of 88 local residents seeking apartment upgrades; the person who finally inched to the top signed up in 1979. Mayor Valentine Kareva, a Chukchi, told us Uelen's population has been stabilized by a high birthrate, encouraged by national incentives to have multiple children to stem Russia's declining population. About 75 miles southwest from the tip of Asia, we arrived in the marine mammal hunting community of Lorino, perched strategically on a high plateau overlooking the sea. After the Soviet Union dismantled in 1990, Lorino's population dropped by 1,000 to the current 1,500 as state-run collectives fell apart. "In Soviet times, life was like a boiling kettle – everything was working," said Mayor Victor Kalashnikov, a Ukrainian and 23-year Lorino resident. In response, Lorino Chukchi formed a cooperative where the best hunters share boats and equipment to help feed the community. Last year, it harvested 56 gray whales and 300 walrus to supply about 40 percent of the community's nutrition needs; the rest comes by occasional summer supply ships when the ocean is not frozen. The village's youths compete in walrus-skin-boat races and the challenging Nadezhda (Hope) sled dog race and learn ivory carving and Native dancing from their elders. Lorino boasts one of the few land connections in the region, a 23-mile, teeth-jarring gravel road connected to the regional hub of Lavrentiya. Upon our arrival there, we discovered we had left behind our permit allowing us to visit the special Arctic zone of Chukotka. Even with a faxed copy sent a few minutes later, border guards opted to exert their authority. Nine of us were detained, charged with violating federal law and marched before a fast-talking, black-robed judge who fined us each 500 rubles, about $8. We were finally released into the bright Arctic daylight at 4 a.m. In President Putin's Russia, such petty harassment of Westerners is commonplace. And most Russians we encountered praised their leader – whom one dubbed "the strong and beautiful" – for restoring pride and order to their battered country. Much of the earlier excitement of the "Melting Ice Curtain" era seems dissipated, burdened by paperwork and fading memories of relationships across the Strait. Still, many Russians retain a special kinship for their former fur colony. One Provideniya resident rushed up to find out where the obvious foreigners were from. When he heard "Alaska," he pointed across at the eastern horizon with a thumbs-up and wide grin. David Ramseur worked to melt the Alaska-Russian "Ice Curtain" working for Alaska Govs. Steve Cowper and Tony Knowles, and is writing a book on Alaska-Russian relations for the University of Alaska Press.